It's 21:27 in Alexandria, Egypt right now. Bibliotheca Alexandrina A nice view onto the sea from the Bibliotheca Alexandrina. Tel Aviv: Beach View, 291.6 miles away. Tel Aviv: Beach and Marina, 291.6 miles away. Ramat HaSharon: Weather in Ramat HaSharon, 294.9 miles away. Rosh HaAyin: Weather in Rosh HaAyin, 301 miles away. Dahab: Live from Dahab, 331.8 miles away. Dahab: Kite Lagoon, 331.8 miles away. 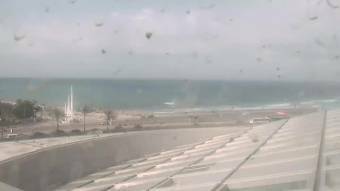 Larnaca: All You Can Surf Windcam, 333.1 miles away. Sharm el-Sheikh: View of the Red Sea, 350.1 miles away.